Action: Drive Somnambulant Dreamer insane to choose and wound an exhausted character with skill 2 or lower. Flavor Text: "I don't know what happened, officer. 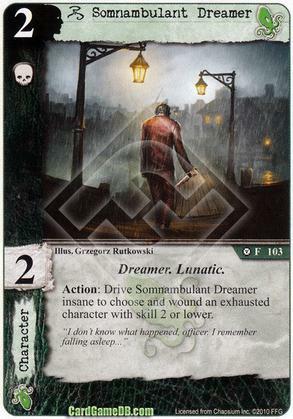 I remember falling asleep..."
Am I correct in thinking that the Somnambulant Dreamer can kill insane characters (assuming the target is in an exhausted state)? Insane characters are neither ready nor exhausted when turned facedown, regardless of whether they are upright or 90 degrees sideways, and cannot be readied (or exhausted) until they are first restored. So while they have 0-skill they can't meet the exhausted requirement. What about Diseased Sewer Rats instead of the SD? Only requirement is skill of 2 or less, so that would work, right? Yes, diseased Sewer Rats work. There are a small number of cards that consult "printed skill", which for an insane character is indeterminate but for purposes, Rats included, they appear to be a zero skill character. Cool, thanks. The Rats were the main inspiration for my question, but I thought I'd show a little love to the Dreamer since he hadn't gotten any comments before. I hadn't anticipated the "exhausted" condition being a problem, but I'm glad it came up because I hadn't thought of that being an issue. It's a little weird because the original rules clearly envision an insane character being able to be exhausted or ready (check out the rules refresh text), but it provides no way of tracking the state since there is a fixed orientation for insane. They had to fix this, either by making two orientation's allowed and meaningful or removing the question for insane characters. They settled on the later, making the game a three-state system, instead of the four-state system I think the original authors were thinking of.